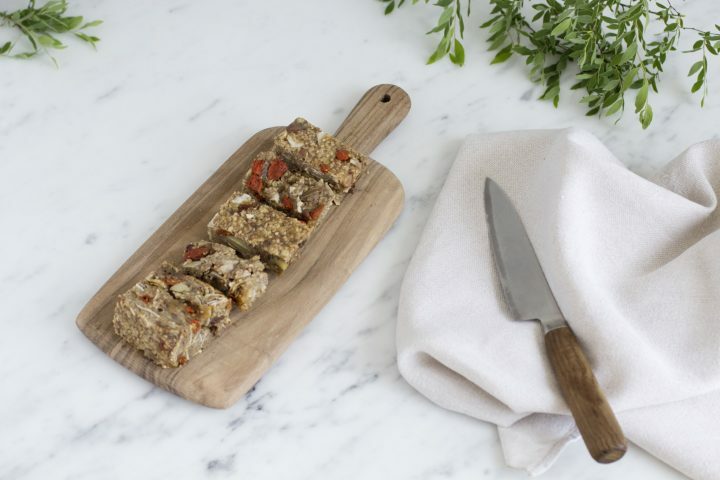 Granola bars are the perfect snack; simple to make, healthy, delicious and easy to take with you. These bars are full of natural and good nutrients like nuts, seeds, oats, dried fruits and – of course – granola. We also added some banana to make them stick. Make sure to add enough, otherwise they will fall apart. The recipe can be fun to experiment with by adding different granola flavours which will make them taste slightly different each time. It takes about 35 minutes to make one batch of about 10 granola bars (the number depends on how you cut them). When your granola bars are ready, it’s best to let them cool down before you put them in the fridge. 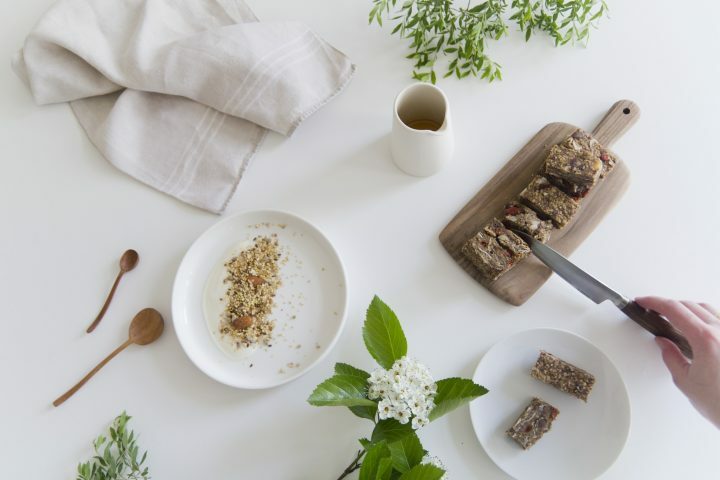 We love to wrap some of the granola bars in a piece of baking paper to make them more portable – this way you always have a snack ready when you need one! Heat the oven up to 180°C. Whisk together 6 tablespoons of water with the flaxseed in a bowl. Toss together all dry ingredients (oats, granola, walnuts, dates, coconut flakes, sesame seeds, goji berries, cinnamon, salt) in a bowl and stir well. Place the bananas, maple syrup, vanilla extract, coconut oil in your food processor. Add the flaxseed-water mixture and mix it. Add the liquid mixture from your food processor to the dry mixture and stir it by hand. It’s important that the liquid mixture is sufficiently blend into the dry mixture to prevent the granola bars from falling apart. Your mixture should be a little bit sticky. Line your baking plate (a large one, approximately 20 cm x 30 cm) with parchment paper and spread out the granola bar mixture on top of it. Make sure spread it out evenly, with a thickness of about 1,5 cm. Put the baking plate in the oven and bake for 20 – 25 minutes until the edges of the mixture are golden brown. 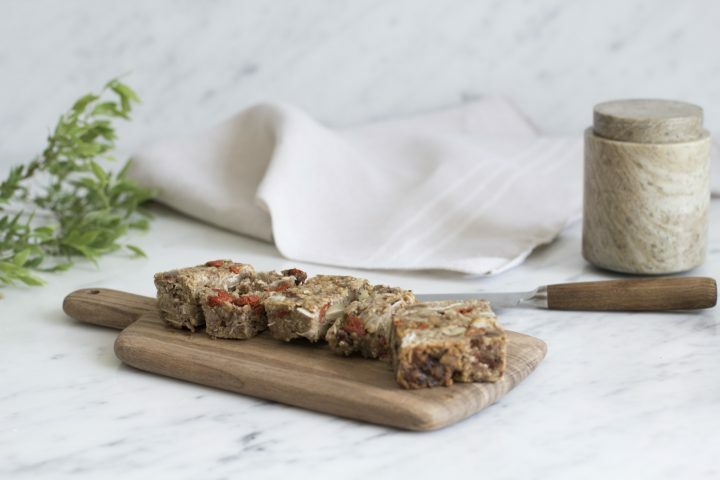 Let it cool down and slice into granola bars. Enjoy your homemade granola bars!